We’re just days away from one of the biggest holidays that calls for dressing up in full costume, and of course hair & makeup are part of the package when it comes to creating the perfect look. There are so many ways to amp things up for Halloween – false eyelashes, contact lenses, hair extensions and wigs, unlikely uses of traditional products like lipstick and eyeliner, and so much more. I wanted to share some of my fave looks from around the web to inspire your Halloween costumes this week – don’t forget to share your looks with us on social media either! We love to see creative ways to use makeup and tools to create the ultimate, all-out costumes and disguises. This has been an increasingly popular look in recent years, but for good reason! It’s such a fun way to try something different – it’s not like you can realistically get away with it any old time of the year. A quick search for “comic book makeup” on Pinterest will give you all kinds of links to tutorials and variations of the look. It’s also an easy, cheaper way to do a costume since you don’t have to go too out of the ordinary with your clothing. Okay…perhaps you’re noticing a trend. Nothing too scary yet, right? I’ll admit it, I tend to favour the cute and fun costume ideas over the scary and gory kinds. I’m just not big on all the blood & guts! I love simple looks like cats or doe-eyed deer, and this one is just stunning if you ask me (hell, I’ll wear that cat-eye any day of the week)! This is a good option that is really simple and easy to pull together in a pinch. The Day of the Dead is a Mexican holiday celebrated Oct. 31, Nov. 1 and Nov. 2 to remember and pray for friends and family who have passed away – now that’s my kind of take on Halloween. Part of the holiday involves sugar skulls, and the look has become a common Halloween “costume.” I love this idea because who doesn’t want to create a totally customized, creative and visually stunning look on Halloween? This ain’t your average face paint folks – this is a look that gives you plenty of freedom to do what you feel! 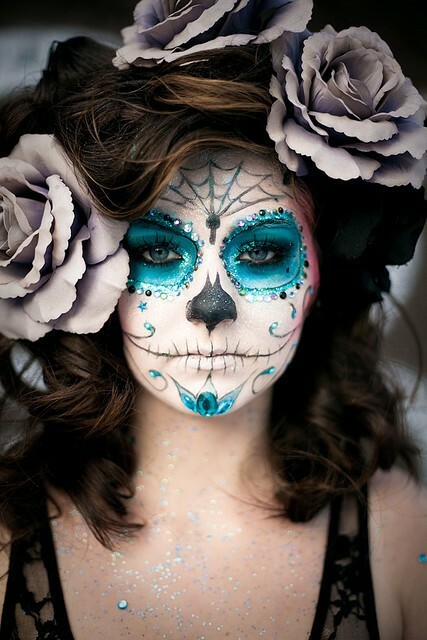 A quick search for “day of the dead makeup” or “sugar skull makeup” will bring up all kinds of inspiration. What are your beauty plans for Halloween? We’d love to hear what you’ve got up your sleeve! It’s no secret we’re in the business of brides here at BP, and we’re always interested in sharing articles and content that will help them navigate the wedding planning process. Most brides count on their bridal party to help them get ready for their big day, but it can be a big task to take on for them to participate. This article takes you through some key things to keep in mind when planning your wedding to make sure everyone feels appreciated and things are looked after in a fair matter. Do you agree with the advice in the column? Let us know in the comments! Although we’re heading into the last weekend of July (yikes! ), we still officially have a solid two months left of summer to get through, and that means we’re not putting away our shine-combating products any time soon. While catching up on my reading, I came across a recent roundup of mattifying products from Elle Canada that has me excited all over again for new things to try to eliminate my 3 p.m. afternoon t-zone meltdown. It includes some of my old favourites (hi, Make Up For Ever!) and some products I’ve yet to test drive – something tells me my next trip to Sephora will be a pricey one. Do you have any products you rely on to manage the summer heat? What’s missing from the slideshow? I was scrolling through my Facebook feed when I saw our very own Arianne (a.k.a the Glitter Geek) share a really interesting article titled “How Men on Tinder Reacted to Three Different Levels of Makeup.” A beauty social experiment, you say? You have my attention. I’ll leave you to check out the article for the interesting results, but it got me thinking about how my makeup affects how others look at me. Vain as it sounds, Brinton’s experiment obviously proved that as much as we’d like to think everyone has good intentions, appearance plays a role in how we interact with one another. Have you had a similar experience to what the author found in her Tinder experiment, either in dating or even just in regular situations like work or social settings? Do you find your makeup can have that big an impact on how others approach you online or in person?